L-R: Martyn Pask (Regional Director), Sarah Hewitt (Marketing Coordinator), Sarah Allsop (Planning Manager), Andrea Slater (Senior Secretary) and Lauren Slater (Andrea’s Daughter). 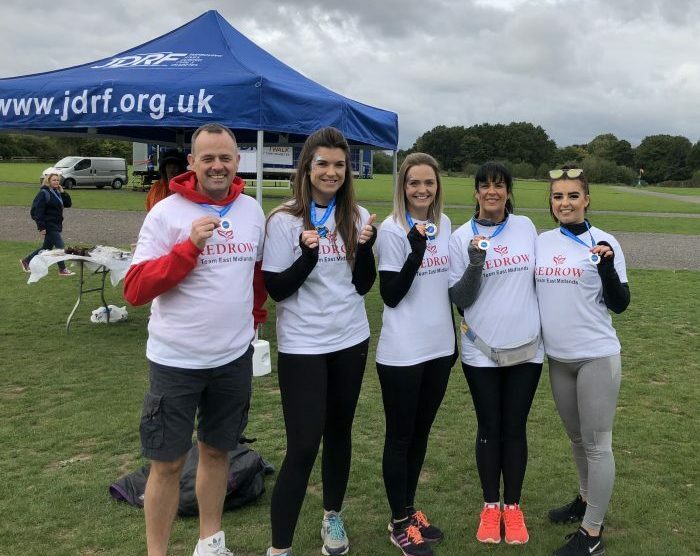 An East Midlands housebuilder took part in a charity walk for Juvenile Diabetes Research Foundation (JDRF) and raised over £500. Redrow Homes East Midlands entered five team members into One Walk Midlands at Drayton Manor Park, Tamworth. The event was organised by JDRF, which hosts One Walk events across the UK to increase awareness of type 1 diabetes, and raise much-needed funds for research. The East Midlands team completed the 5k walk and raised a grand total of £550 for the organisation. Sarah Hewitt, Marketing Coordinator at Redrow Homes East Midlands said: “It was wonderful to take part in One Walk Midlands and see everyone come together to support JDRF. One Walk started in 2014 and since then, JDRF’s UK One Walks have raised over £1.3 million for research projects. The Steve Morgan Foundation, founded by Steve Morgan CBE, Chairman of Redrow plc, gifted £3 million to the Juvenile Diabetes Research Foundation earlier this year.